With the new financial year comes a new project. This project is the NHK World program, Mapping Kyoto Streets. As script advisor, I will be spending more time on the train to Kyoto for meetings and filming, but I’m looking forward to the opportunity to visit Kyoto more often and discover more about this ancient city. When I imagine my friends, colleagues and family watching this show, I start to worry if the narration is interesting enough. I also get nervous about the host and the narrator reading the translations I’ve prepared. Most people look at nervousness as stress, but nervousness, for me, is interesting. It is proof that I care about the work at hand. The Japanese version first appeared in the April 2012 issue of the goodspeed monthly newsletter. 日本語バージョンはグッドスピードレター2012年4月号に掲載されました。 Mapping Kyoto Streets premieres on April 12 and airs once a fortnight. You can watch the show online, in real time. Check the web site for screening times. 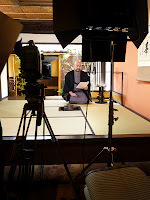 Pictured, here, is Randy Channell Soei – the host of Episode 1: Sanjo-dori – rehearsing his lines.